Colin and Cameron are both members of a "young saver's club" at a credit union, and this year, the credit union invited all of their members out to a skating party. Now, normally, I would have tossed the invitation, but this year I thought to myself that the boys are probably old enough now to attempt something like this. Then I thought--this would be a great family activity for all of us! So last Saturday, we loaded up and took all three of them out to the skating rink. What an adventure, but in a really good way! The thing about having THREE children is that now, they outnumber us....so it is hard because at all times, either Shane or I have to be with two of them at one time. Sounds easier than it really is, especially when you have two children ages 3 and under who have never worn a pair of skates in their lives! :-) Ethan was asleep in his carrier when we got there and slept for probably the first 30 minutes, so that made things somewhat easier to start off. Shane and I took turns with the boys, and within 5 minutes, Colin had a good enough hang of things that we didn't have to hold his hand constantly. Cameron, on the other hand, was a completely different story. 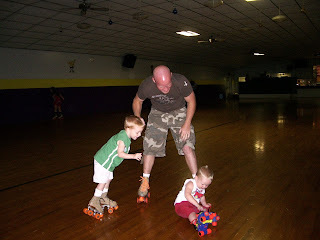 As you can see from the video, Shane basically had to lean over Cameron, holding his hands and most of his weight, for the duration of the time that Cameron was on the skating floor. Needless to say, that didn't last too long...in case you hadn't noticed, Cameron is decently beefy and isn't exactly the lightest child. :-) Plus, he wasn't all too fond of the skating anyway, unfortunately for us the party had fallen very close to his upcoming nap time, and he was pretty tired within just a few minutes of our being there. So, after a little while, we ate some lunch. It was so nice, because the credit union provided lunch, drinks, and an ice cream cone for each child, plus a little goody bag! And, there were random drawings for prizes during the party, and Colin won one of them! He was very excited about that. Ethan was awake by lunch time as well, and in a great mood! 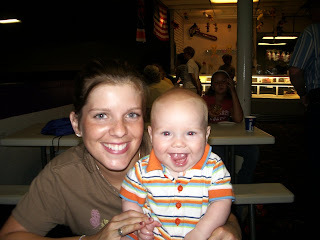 Hence the reason for the huge smile in this picture (is is just me or does Ethan look EXACTLY like Colin when he was a baby in this picture? It is crazy!) 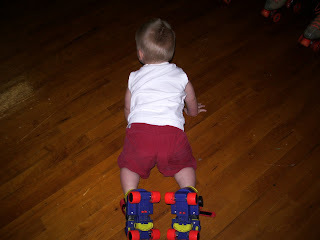 So, since Cameron was fading, and Ethan was awake, and Shane doesn't exactly love to roller skate anyway, I took Colin out on the floor again for a little while. Then, after a few minutes of skating, they called for everyone to line up that wanted to be in the skating races. 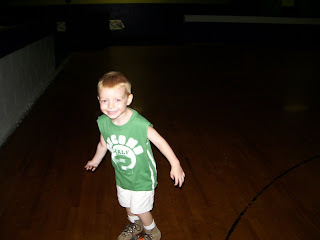 Now, this is nostalgic for me, since I used to go out to the skating rink all the time when I was little and ALWAYS did the races, and I was hoping Colin would want to participate. He did, and I was so proud of him. He stood up there to race and was all by himself for a little while....I thought he was just going to be racing solo, but the skating guard went and got the son of the lady who actually runs the skating rink to race against him! Needless to say, the race was slightly unevenly matched, and Colin fell a couple of times during his treck to the finish line, but I was so proud of him, he raced all the way to the end and won himself a bag of cotton candy! It was weird for me....I have heard people talk about that "feeling" you get when you watch your child do something competitive. How proud you are of them, how you so badly want them to do well, not get hurt, and love what they are doing all at the same time....I felt that for the first time in my life watching Colin do this. I was cheering for him and nearly crying all at the same time as I watched him trying so hard to skate. Even now, as I sit here typing this, my eyes feel a little teary! :-) Make fun all you want, but you will get there someday with your own baby if you haven't already, and then you will know exactly what I am talking about! But he did finish, and he did do well, and he did love it, so I was extremely happy for him and proud of him and what he had just done! We decided soon after that we should load up and head home (a process in itself) and on the way out the door, we stopped at skee ball for just a few quick games. That was interesting to watch Colin try to get the ball in the hole! He did pretty well (with Daddy's help). It was a lot of work for both Shane and me, but what a great time we all had. We rewarded ourselves with a mozzarella burgers from Gross' Burgers for lunch (and some garlic fries too!) and it was a great ending to our family adventure for that day! well, I am exhausted from that! Looks neat though! What a family!!! I have a memory of skating young like that. My parents have it on tape. If I can figure out how to show you I will. Hilarious!!! Gross Burgers - terrible name yet wonderful food!